I love Silly's. Really, I do. I have a crush on this cute little neighborhood restaurant with an awesome menu and even better decor. Really, no complaints. 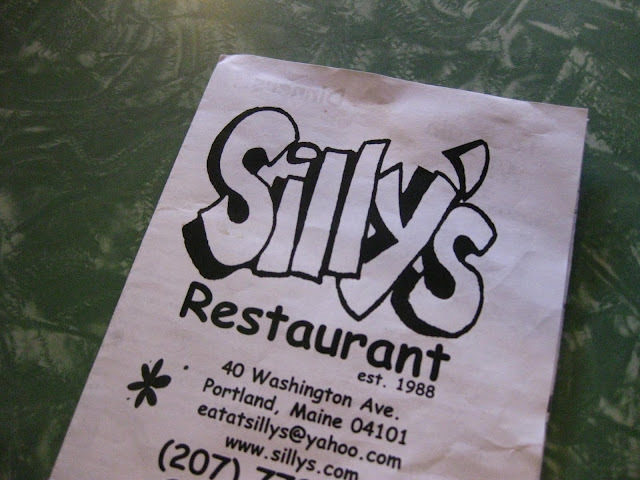 I first heard of Silly's this time last year, when I was working on the parking crew for the Portland Flower Show at Portland Yacht Services. One of the guys came back from lunch, and because I love harassing people about their dining experiences, I asked him where he went. My ears perked up when he said, Silly's! and I'd never heard of it. I've been there several times since my discovery a year ago, and this time around I went with my Best Foodie Friend (BFF) Elizabeth who was visiting from Baltimore. 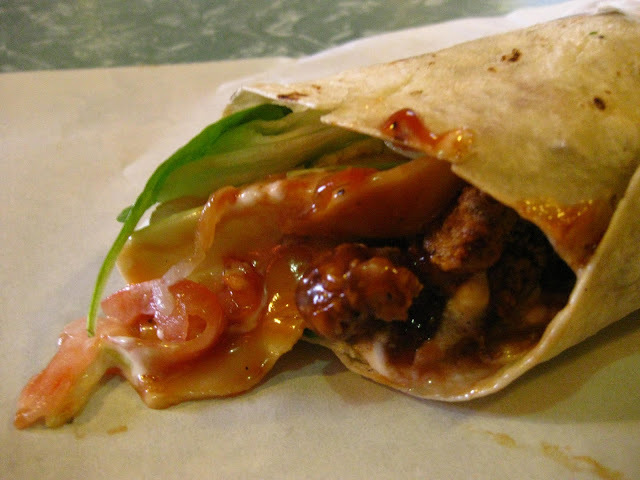 OK, my one problem with Silly's (and this is not necessarily a bad thing) is that I love their Chix Magnet wrap so much, that I can't bring myself to order anything else. You know the age-old dilemma: Well, I really should order something else, I always get the same thing. But what if what I order isn't as good as the wrap!? Then I'll be stuck wishing I'd just ordered the damn wrap. (And you know this has happened to you before). So I always cave and get the damn wrap. But it's so delicious! The BBQ sauce, hot sauce, and Ranch dressing all mix togther deliciously over fried chicken strips to make a sauce that is always trying to run down your arm. And there's plenty of veggies in it (hooray, spinach!) to make you feel like you're not eating pure junk food. 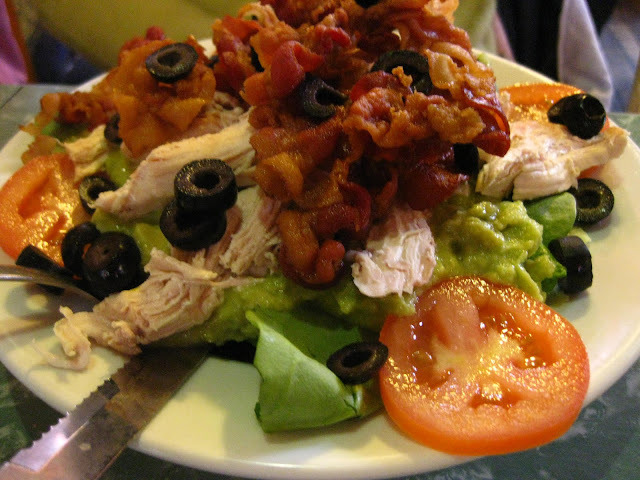 Elizabeth went with a salad, in an attempt to be healthy, which I don't know was really accomplished with all that bacon. Silly's does definitely not skimp on the bacon, weather it's their Gravy Danger (poutine with bacon) or their peanut butter bacon milkshake. 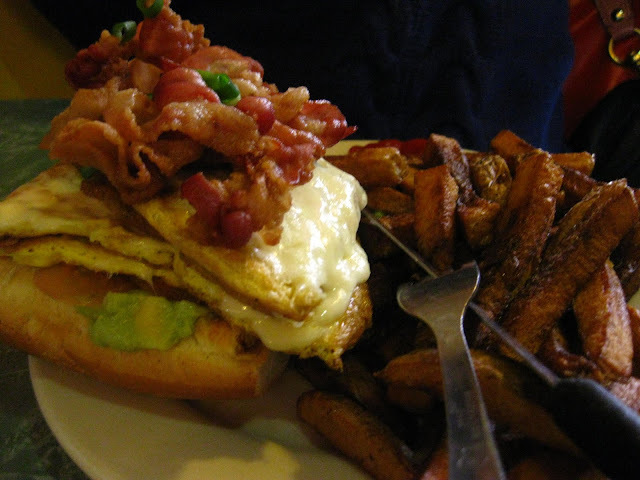 B. had a Eggy Pop, which is eggs and bacon over focaccia. With fries! Love it. The best part about this place is that it accommodates all types of eaters. Vegetarian? (C. had some fine looking falafel!) Vegan? Huge carnivore? Fried food lover? Gluten free? Check. You really can't go wrong with Silly's. Am I being a little over the top? Maybe, but you'll have to check it out for yourself, and I hope you have a great experience, because I really love it there. Oh! 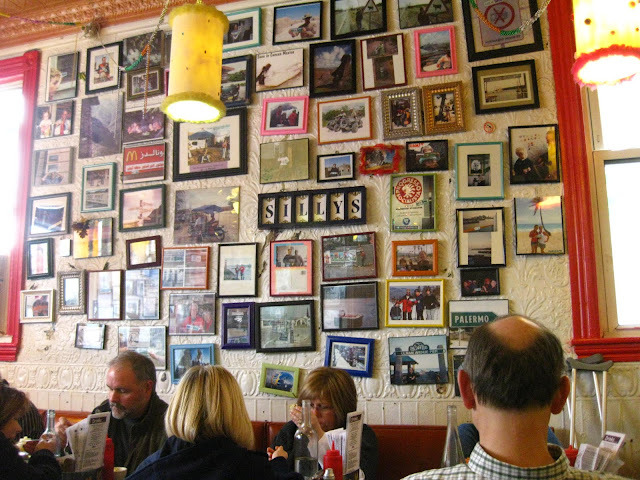 And here's the wall of photos that Silly's fans have submitted. They're pics of 'Eat At Silly's' stickers in places all over the world. I love restaurant decor that entertains me while I wait for my food! Looks like a cute neighborhood place. and you can never go wrong with a big serving of bacon! 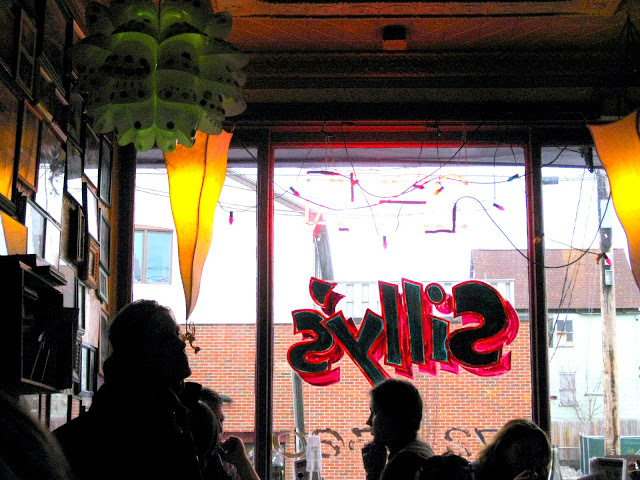 You gotta try the peanut butter and bacon shake at Silly's. Maybe during our bacon crawl. . . I love Silly's! I went for the first time last spring, too. They have vegan milkshakes! I haven't been since giving up the gluten, but any restaurant where I can safely order off the menu floats my boat. I need to go back soon! The garden tables in the back are great.